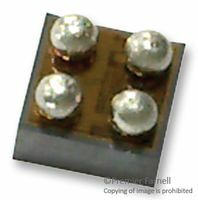 The LMT70AYFQT is an high-precision CMOS Analogue Temperature Sensor with an output enable pin. The LMT70 is also a great replacement for RTD and precision NTC/PTC thermistors. Its output enable pin allows multiple LMT70s to share one ADC channel, thus simplifying ADC calibration and reducing the overall system cost for precision temperature sensing. The LMT70 also has a linear and low impedance output allowing seamless interface to an off-the-shelf MCU/ADC. Dissipating less than 36µW, the LMT70 has ultra-low self-heating supporting its high-precision over a wide temperature range. The LMT70A provides unparalleled temperature matching performance of 0.1°C (max) for two adjacent LMT70A's. 85423190 Esente IVA in base all'art. 17, comma 6, DPR n. 633/72, Risoluzioni Agenzia Entrate 31.3.2011, n. 36/E e 7.2.2012, n. 13/E. Applicare il meccanismo del Reverse Charge relativo ai DISPOSITIVI A CIRCUITO INTEGRATO.